“What’s a Kosciusko?” is something Andrew Morris hears way too often. Although he doesn’t mind explaining to out-of-towners how the word is pronounced — and that it’s the county he was raised in — he’s pretty sick of the question by now. 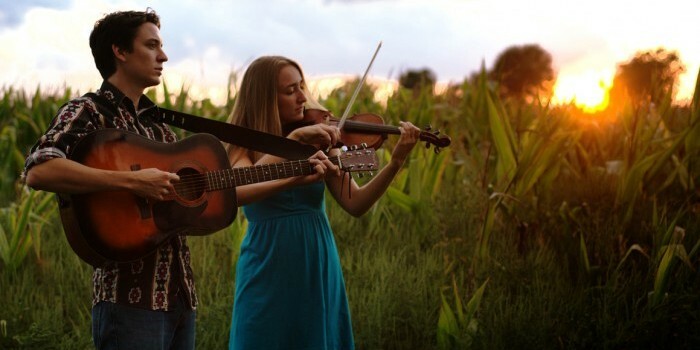 Morris, a guitarist, and his bandmate Julie Bates, a fiddler, are the bluegrass duo known as The Matchsellers. The pair released their album, “Kosciusko County,” in December. They’re currently touring the country, playing nearly a show a day. Morris, from Warsaw, and Bates, from Kansas City, Mo., met in Germany a few years ago and started playing music together. It wasn’t until his stay in Germany that Morris really started listening to and playing bluegrass music. About a year and half ago, The Matchsellers hit the road to play music. They haven’t looked back since. A recent highlight for the band was playing seven showcases at the International Folk Alliance Conference in Kansas City. They also taught a workshop for kids on old time music and country dancing. The Matchsellers’ music is also being played on a few radio stations, from Kalamazoo to Kansas City. Other tracks on the “Kosciusko County” album pay tribute to some familiar, local towns: Beaver Dam, Burket and Claypool to name a few. The Matchsellers plan to return home in May. They’ll be playing a few shows in Indiana, with the closest being in Syracuse at the Huntington Street Bar and Grill from 7-10 p.m. on Saturday, May 3. For more information about the band and their tour schedule, go to thematchsellers.com. With The Papers since 2008, Rebekah especially enjoys writing about local community members as well as the local art, entertainment and food scene. Married to Brian, an art teacher at Wawasee High School, the two live in Goshen with their corgi dog and two cats.